You all know I love Cleveland. That much is obvious. But for all my love for my city, this shirt is a misnomer: I left Cleveland this week, boyfriend & cat in tow, so as to be far, far away while my city plays host to the Republican National Convention. My neighborhood, Tremont, is only about a mile & a half from downtown. It's less accessible by foot than other neighborhoods, which I'm sure are busier this week - but even before the RNC began, we started seeing increased activity in our area. All the restaurants were packed! Don't get me wrong, I'm honored that our humble city is playing host to such a major national event - but as a diehard liberal & a Hillary supporter, I can't say I'm too excited about the event itself. With all the violence happening lately & all the hateful rhetoric being spewed during this election season, I wasn't especially keen on sticking around for the party at the center of it all. And so our little family drove south to my hometown, Cuyahoga Falls, where we're spending the week with my mom & her two puppies, enjoying the air conditioning & all the suburban shade. I've been working from my favorite Starbucks again, eating at some of my favorite restaurants, & of course playing Pokémon all around town (though it's slim pickings here!). 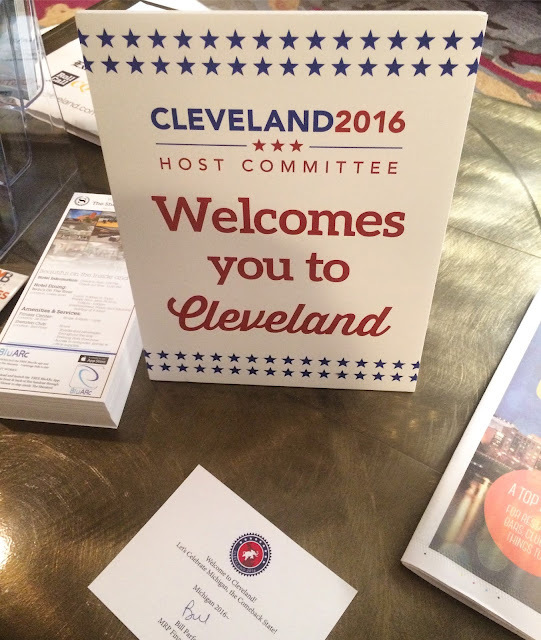 It seems that no one in Northeast Ohio can truly escape the RNC, though, at least not until the event finally comes to an end. The other day, my mom & I were taking a walk through downtown Cuyahoga Falls when she asked if we could stop at the local Sheraton Suites Hotel so she could use the restroom (& so I could catch a Magikarp or two). 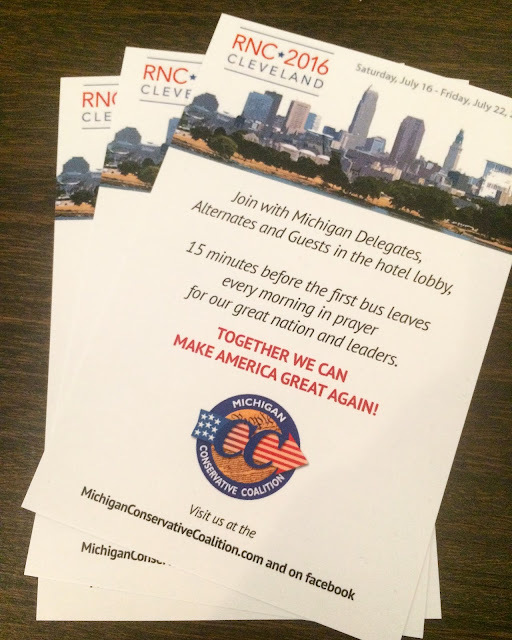 When the hotel doors opened, we were greeted by... Republicans. OK, we weren't actually greeted by Republican. 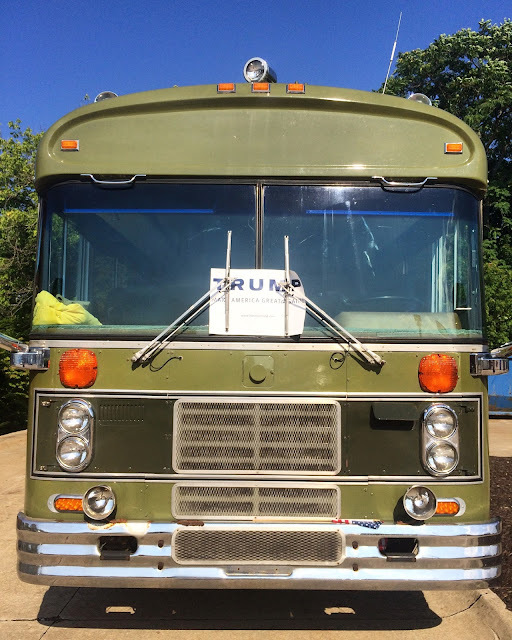 But we were greeting by the greeting for Republicans. 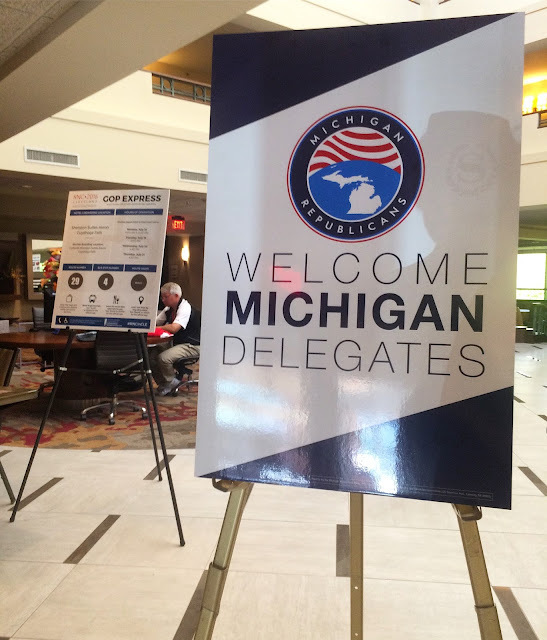 It seems the Michigan delegation is staying right here in town! Yes, Cuyahoga Falls is a bit of a shlep to Cleveland, though at least the Michigan folks aren't staying in Sandusky, like the California delegation (actually, it looks like they're having a helluva time at Kalahari Waterpark...) While they're a bit far from the action - an entire county away, even - it seems they got as warm a welcome as anyone. 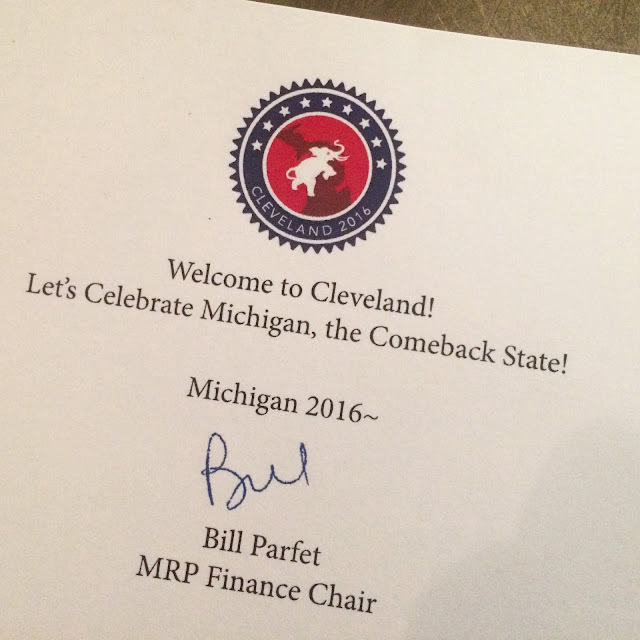 Let's zoom in on the item in the bottom left: Michigan, it seems, has taken to calling itself "The Comeback State." 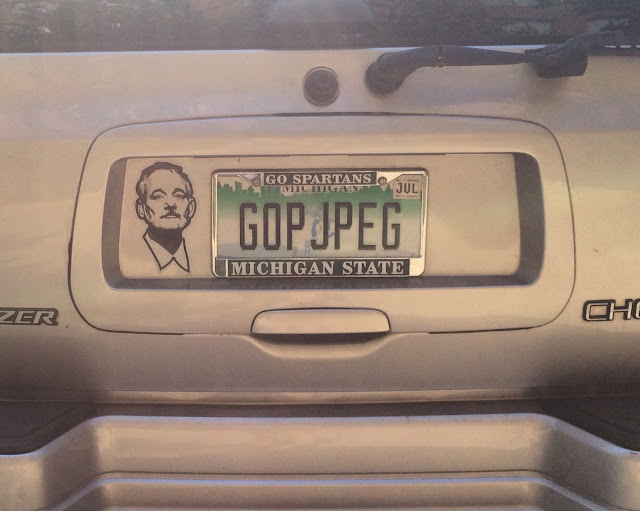 Don't get me wrong, Michigan needs & deserves a comeback, but, like... is it there yet? Is this proclamation perhaps a bit premature? And every morning, before they board it, they gather for a quick prayer circle to ask God & Jesus to make America great again! Maybe it's just me, but I tend to think "making America great again" looks more like reforming education, enacting gun safety laws, & restoring jobs, & less like plagiarizing speeches, calling for executions, & vilifying a civil rights movement, but... you know. Like I said, maybe that's just me. OK, OK, I wasn't going to get political here. Sorry. Have you ever known me to keep my opinions to myself? 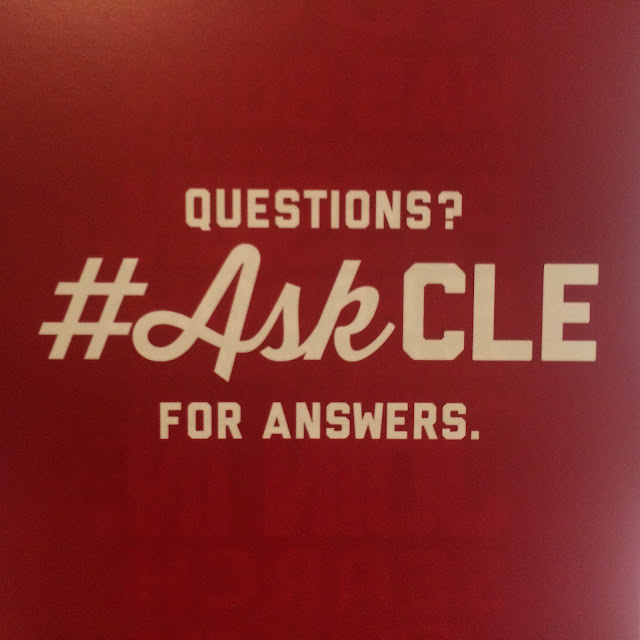 The Cleveland visitors bureau launched #AskCLE, a brilliant online initiative to answer city-related questions during the RNC. In my ongoing question to be an unofficial ambassador for the CLE, I've been scrolling through them & tweeting some of my own input (restaurant recommendations, etc.) when appropriate. What a great idea for a social media campaign! But as much as I like seeing our city in the national spotlight, I wish it were for something more positive, & frankly, I kind of miss home. I'm looking forward to the weekend, when everything settles down & we can head back north. So I guess my only #AskCLE question is: Will this three-ring circus be over soon?